Candle spell work is probably some of the easiest, quickest and most effective spell work in the books. But we've all been there: That moment when the tea light ends up taking four hours to burn and you have to set it in the bathtub so you can do other things. Or when the birthday candle, which was the perfect size, fizzles out in three seconds and you're left wondering if it was your spell or the craptacular candle you purchased. What if you could avoid both and add an amazing visual effect plus some extra energy to your punch? I'm going to break my standard tone for blogs for a moment. Maybe it's because it's 4 in the morning while I'm writing this and I have ritual later today or the fact that my husband's surgery is this Friday. I try my best to maintain an ambivalent tone about reviews - to be as honest as I possibly can be for my readers. But it's hard to use any sort of skepticism for this product because I'm crazy excited to bring this review to you. TheWitchery.ca's Magical Flame Candles are probably one of the coolest witchcraft products I've ever had the privilege of reviewing. 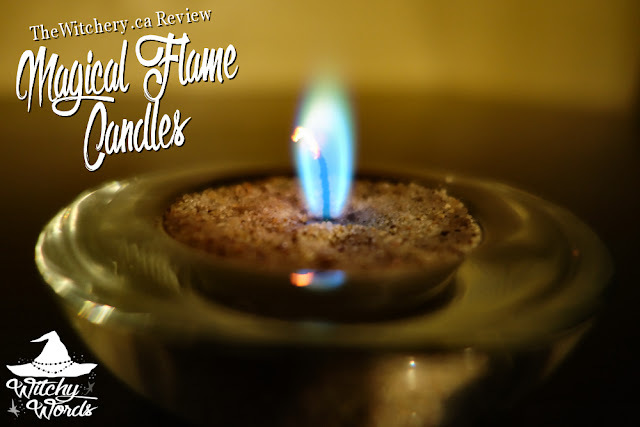 I'm saving the best feature of these candles for last, so make sure you read the whole review through! Let's dive in. At first glance, you'll notice that the candles are fantastically sized. They're going to burn not too fast but not too slow, leaving you around 10 or so minutes to do your thing (times varied between 8 and 15 per candle with the red lasting the longest, but that may just have been my set). These candles are perfect for candle spells - charge the candle, light it, say a few words, meditate into the flame and boom, you're done. They'd also be great to pair with simple spell work, like creating small sachets or charging a single stone or rune for a purpose. 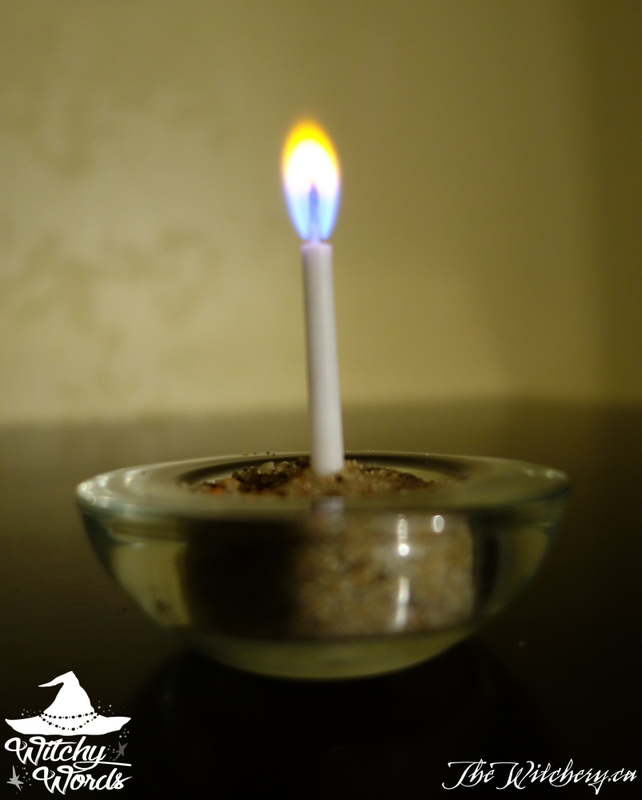 You won't have to walk away from this candle or leave it in your bathtub. It's going to run for the perfect length of time. 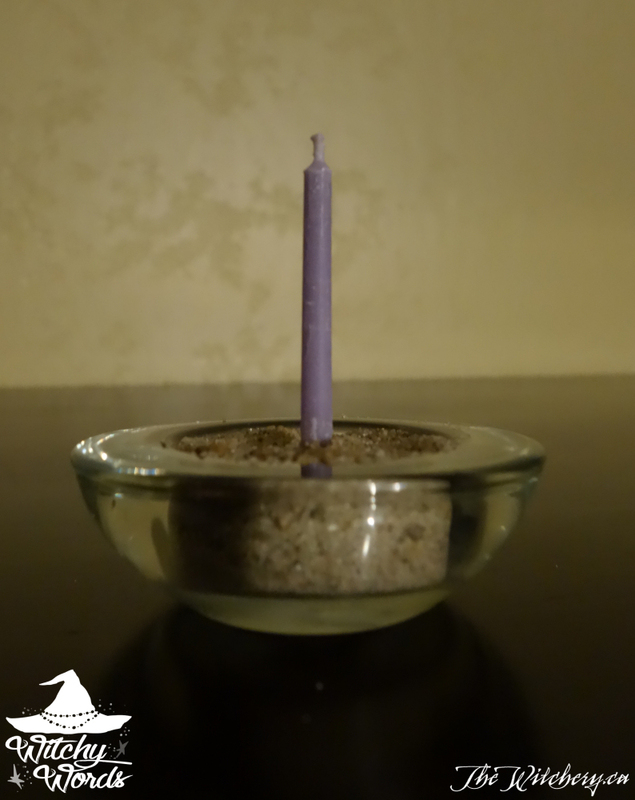 While it may be difficult to run across a candle holder that will keep these little guys upright, I used a tealight holder with some sand and it worked perfectly. Particularly at night, when the sand became cold and dry, adding a drop or two of water helped to secure the candle so it wouldn't tip during spell work. Sand was definitely my go-to for this as it never, ever failed me, but you're welcome to use whatever you'd like. If you do opt for sand, you'll likely have some remnants from your spell work. That's totally normal. 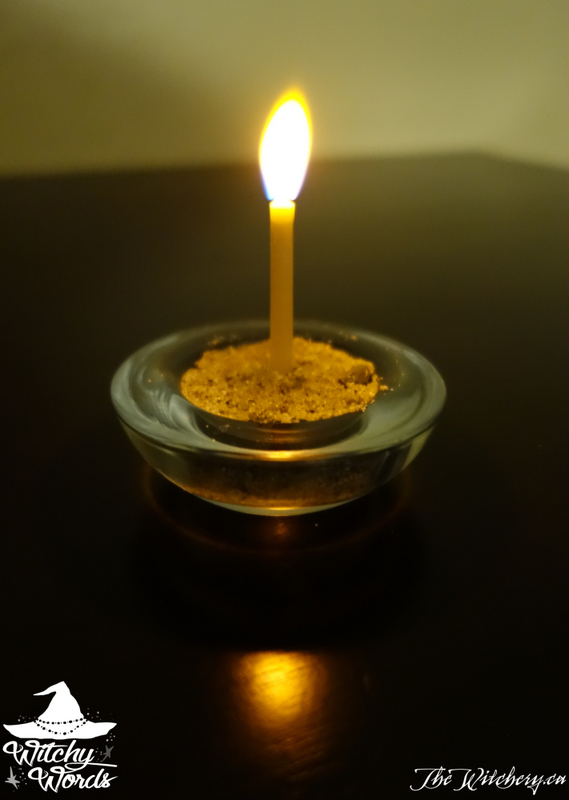 Each candle I burned had the sand around it along with a tiny little nub. Make sure you bury your leftovers after your spell to return the energy to the earth (my preferred method of spell remnant removal). There was only one instance where I didn't immediately bury the remainder; that spell was for our future home, so I put the remnants in a jar to be buried on the property of wherever we move. My roommate Tony and I spent two weeks or so trying out these candles to help us with current situations. We have a lot going on, what with moving, my husband's surgery and Tony's job change. We certainly weren't frivolously throwing around spells just to burn the candles. That would be quite disrespectful, so I ensure you that every candle here was burned for a much needed reason. 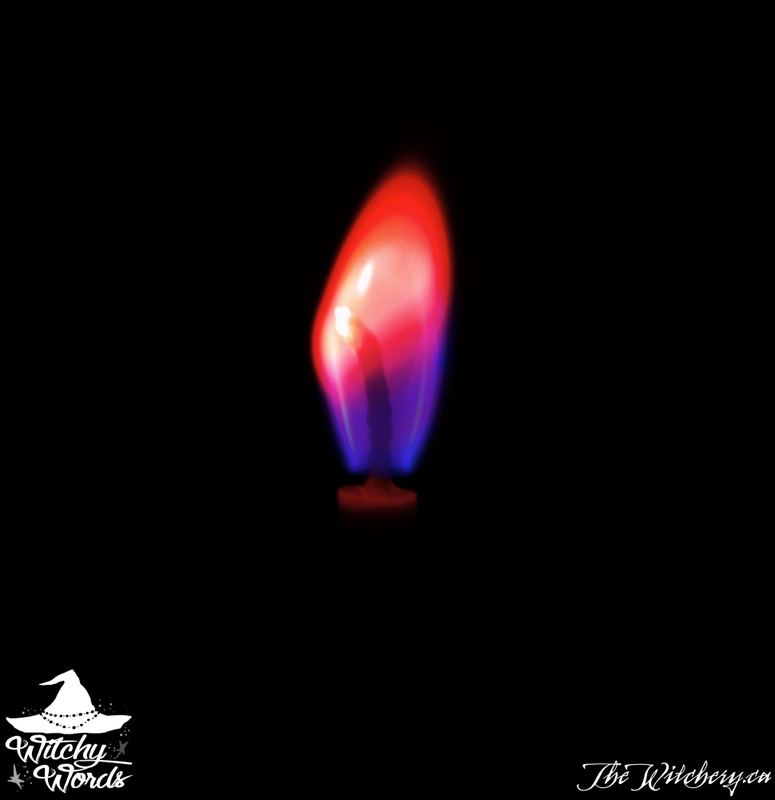 TheWitchery.ca offers up a list of color correspondences for each of their six colors. While my color correspondences differ, I stuck with those listed because I'm certain that each candle was made with those intents. To stray would likely be a conflict in energy. With the way our life is right now, that's the last thing we needed. 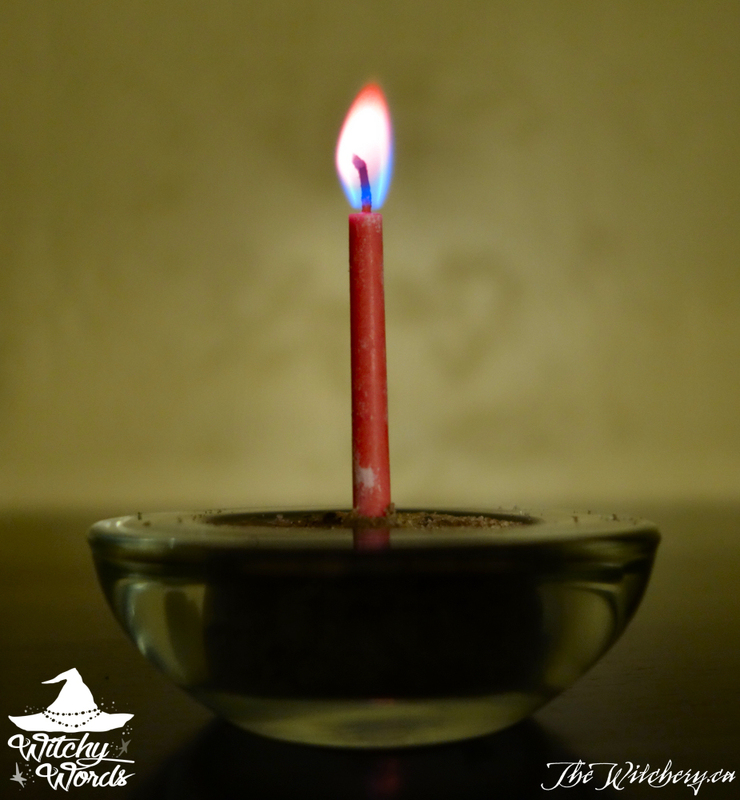 So what's the most amazing thing about TheWitchery.ca's Magical Flame Candles? The flames are literally magical. 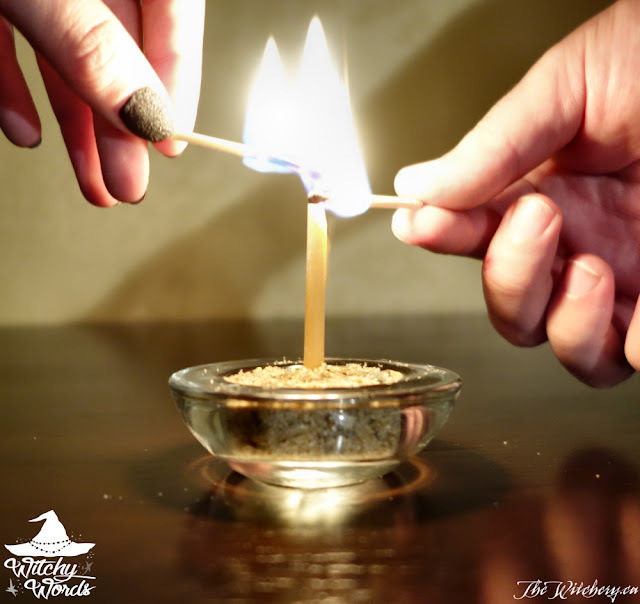 Each candle's flame burns the same color as its wax. 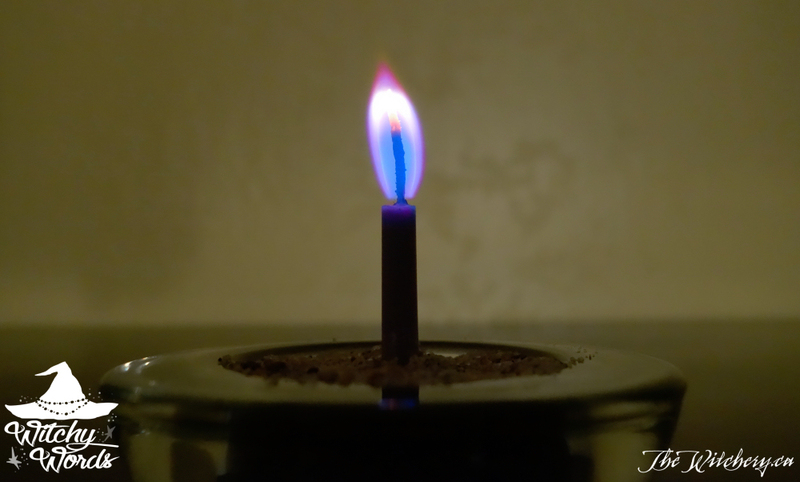 The pictures I offer here in this blog entry, aside from aesthetics, are unedited for the color of the flame. I will present to you exactly what I saw! The blue was probably one of the most obvious flame colors. 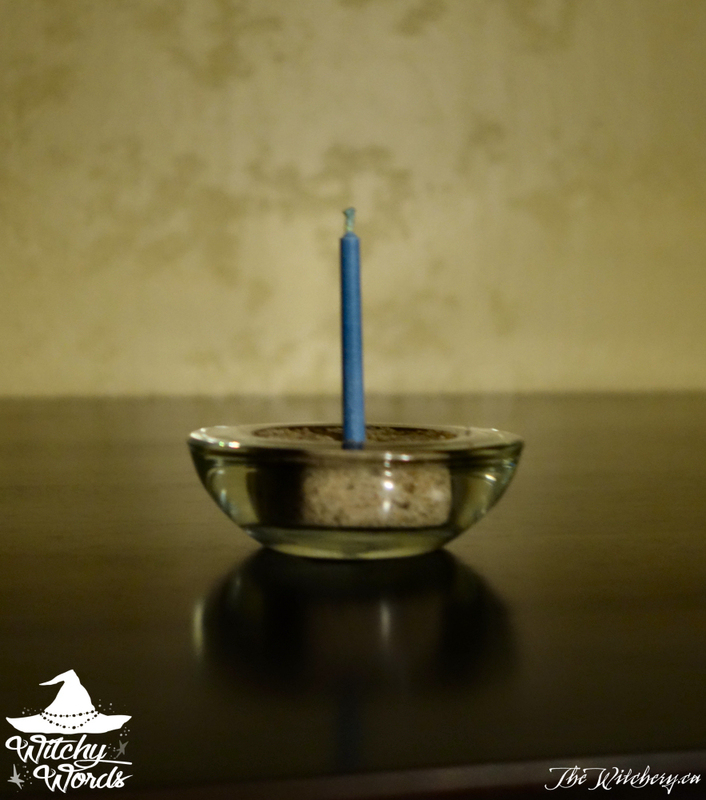 Blue is used for spirituality, health and a peaceful home according to the correspondences on TheWitchery.ca, so my roommate and I lit this candle together, both charged it with the intent of finding a place to live where we will stay for a long while because we truly enjoy living there and where we might see some stability in our lives, and to heal my husband. This is the candle whose remnants I jarred to bury at the new place when we find it. The orange candle also offered full-flame color. It was so much more impressively orange than the picture might lead you to believe. Because orange is for road opening and changes and we're experiencing so many changes right now, Tony and I both lit this one, charged it with a need for positive changes and stability, and buried it out back. The red candle was also incredibly impressive. While it didn't offer a full flame effect, most of the flame was the most brilliant ruby red I'd ever seen. 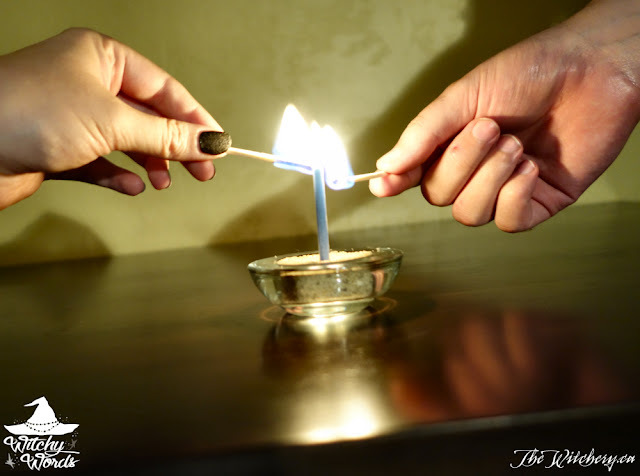 Likely, the intensity and how much of the flame was colored depended what was used in the wax. Red corresponds with sexual love and passion according to the website, so I used this one for me and my husband and buried it out back. 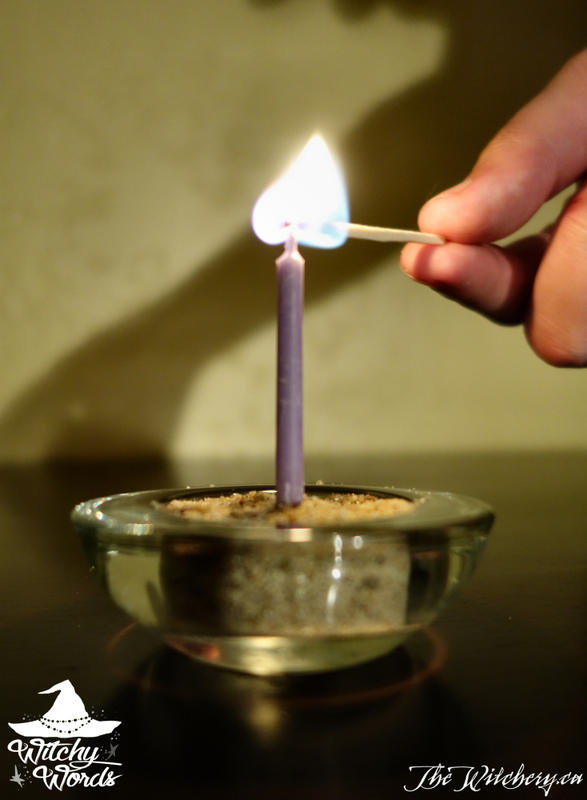 The purple showed the brightest at the tip of the flame and appeared almost more of a pink. The website corresponds this color with conquering, mastery and success. Tony charged it with finding a job, making sure to leave no detail out on location, pay, hours and duration. Since he needs to find one before we move, he buried this one out back. The one that had the least obvious coloration was the white. However, you could still clearly see that it burned white! TheWitchery.ca lists this one for spiritual practices, prayer and marriage, so I burned this one specifically to help my husband with his surgery and recovery. I buried this out back as, hopefully, whatever's going on with his health will be solved by the time we move. And last, but certainly not least, the green candle offered a partial burn of a brilliant neon green. The Magical Flame Candles' green is used for drawing money and good harvest, so I burned this one for a harvest-based money drawing sachet. 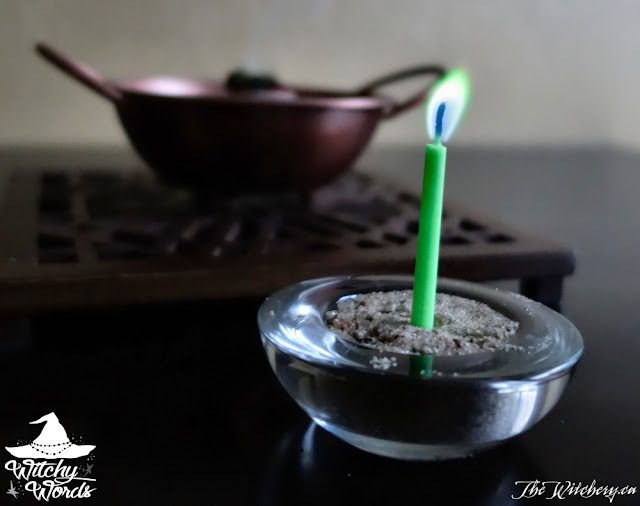 In fact, one of the reasons I wanted to review the candles first is because I also utilized a loose incense powder for the spell as well and would like that review to focus on the incense. While I made the sachet for August Eve/Lammas/Lughnasadh, it's technically geared more towards the equinox. 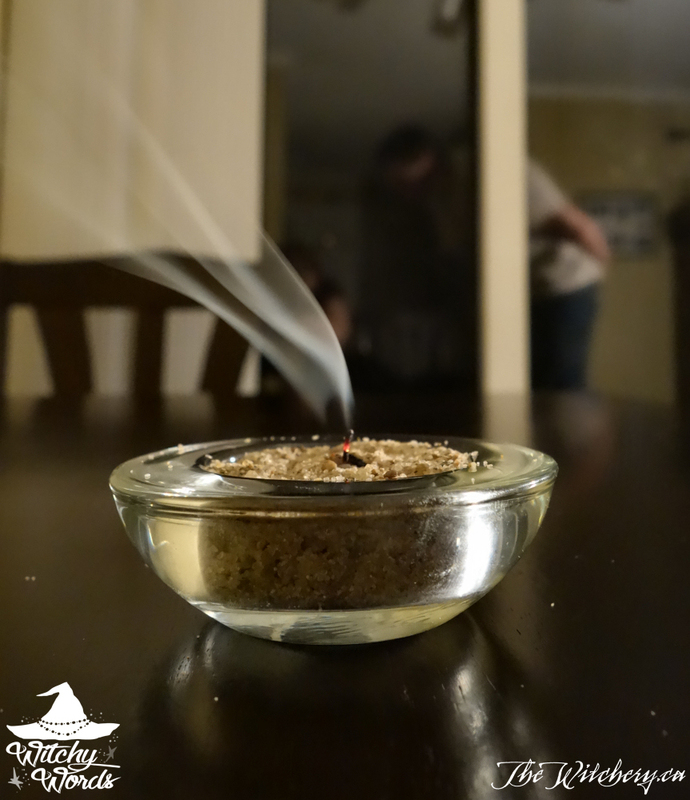 I'll be posting a tutorial for the sachet combined with a review of the incense in a couple of weeks! I want to push two things before I close out this review: First, my pictures do not do the colors justice. You really have to see them for yourself. Second, they're incredibly inexpensive, so you totally can see them for yourself without breaking the bank! They're $6.50 CAD for a set of six in any color you choose or you can opt for an assortment. That's just $5 USD. The site even offers an easy currency converter so that you can check the price in your own currency before having to add the item to your cart. The shipping is a little on the steeper side, but items come properly packed and with an abundance of protection, both physical and magickal, which makes the shipping more than worth the price. Not to mention, if you're international (eg not in Canada), the shipping is actually pretty gosh darn cheap. I mean, guys, candles that burn the same color as the wax? I cannot convey my excitement enough. Go on over to TheWitchery.ca and get your set now! I am so making room in my budget for these. They look crazy awesome! They're so much better than my pictures can convey. I'm so thrilled I got a chance to review them! Love it! Gotta get me some of those! If you do, let me know what you think! They're pretty nifty! I found these candles (not blessed or anything) at the local grocery store in with the birthday candles. Ones where the flame is the same color as the candle? Where at? What brand? I live in Kansas City and I certainly haven't seen anything like that around here.